Recruitment is not something that you can do with 50% effort – you need to get it right, otherwise you’ll end up with a team filled with bad hires. 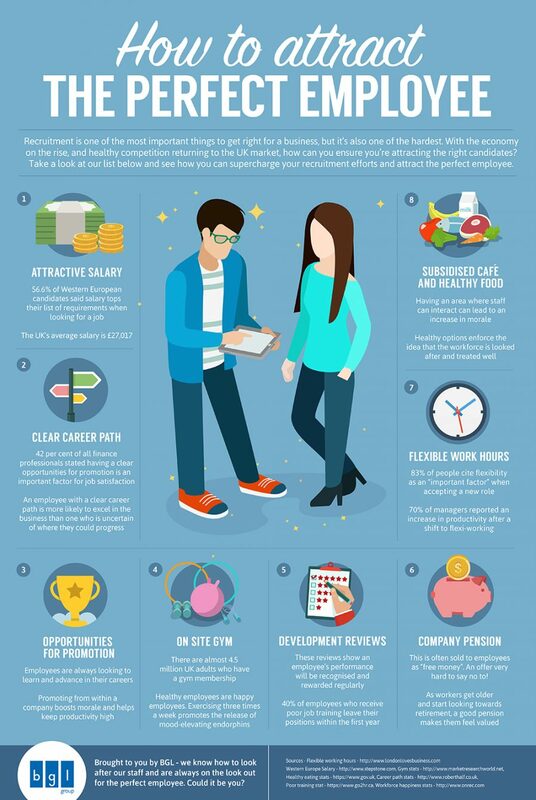 However, it is also one of the hardest elements of running a business – there’s a lot more competition now-a-days and a greater amount of people applying for each position – so how do you attract the perfect employee? Which sets and elements do you have to introduce? This infographic by BGL Group outlines 8 things to get correct. Attractive salary: Salary tops a lot of lists for things that candidates look for in a job, with the UK average being £27,107. Make sure your salary mirrors the job requirements and how hard people will work for their money. Clear career path: 42% of finance professionals state that having clear opportunities for promotions is important for job satisfaction. If your employee is uncertain of where they’re headed, they may not excel as well as someone who is. Opportunities for promotion: Employees are always looking to learn and advance in their careers – promoting within a company boosts morale and keeps productivity high. On site gym: Over 4.5 million UK adults have a gym membership – and healthy employees are happy employees. If you exercise three times a week, more mood-elevating endorphins will be released, so why not allow them to do it on site? Development reviews: If you’ve given employees a clear path to follow, it’s important to show that their performance will be recognised and rewarded regularly. 40% of those who receive poor job training leave the job within the first year. Company pension: As we work through the years, we all want to ensure that we’ll be protected later in life – so a good pension will make them feel valued. Flexible work hours: 83% of people state flexibility as an “important factor” when applying for a new role and 70% of managers report an improvement in productivity after a shift to flexi-working. Subsidised cafe and healthy food: Having an area where staff can interact (such as a cafe) can lead to an increase in a morale and healthy options enforce the idea that the workforce is looked after and treated well.